1. Wash and dry the fruit then cut in half and squeeze the juice into a jug. Cover and set aside. Place the squeezed fruit halves in a bowl with 1.4 litres of cold water and leave overnight to soften. 2. The following day, scoop out the white membrane from the fruit halves with a spoon and tie in a muslin bag. Cut the peel into fine even shreds and place in a preserving pan with the soaking water, muslin bag and reserved juice. Gently simmer, uncovered, for 1½ to 2 hours until the peel is tender and the contents of the pan reduced by almost half. a fast boil. Test for setting point after 10 minutes — place a little marmalade on a chilled plate, run a finger through it and if it wrinkles it's ready. If not, return to the heat and check again every 5 minutes or so until the marmalade is set. 4. Skim any foam from the surface with a slotted spoon, stir in the rum then leave the marmalade to cool for 5–10 minutes until a skin forms on the surface. 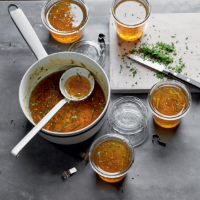 Stir in the chopped mint and pour into warm, sterilised jars — see the Cook's Tip on page 38. Seal, label and store in a cool, dark place for up to a year. Once opened, store in the fridge for up to a month.